The Village Rose Hall kohteessa Montego Bay, Jamaika: Varaa nyt! Spend the day at the beach, drink rum punches at the bar, then dance the night away - all just steps from your door! Great location for business travelers or the perfect week/weekend away. 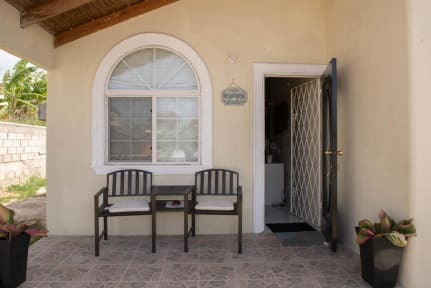 * Studio apartment with 1 bath and fully equipped kitchen * KING size bed * Cable TV, wifi (wireless internet) in room, and Bed linens, towels, and 2 beach towels provided * Fully stocked supermarket on 2 minutes away * Famous Doctor's Cave Beach 15 mins away*ATM machine 10mins * Small in-room safe * Free cell phone provided for your convenience for local and international calls. Popular nightlife and restaurants including Margaritaville, Blue Beat, and the Acropolis are all within 10 minutes Drive distance on the same street. Biggs BBQ and Sports Bar and other restaurants and shopping. You will have the apartment to yourself, it is not shared. Keys are at the front desk of the apartment building, minimal interaction with the host. Other Things to Note: Housekeeping is provided before and after check-in. *Please note guests need to provide property with CVV code prior to arrival in order to ensure booking.